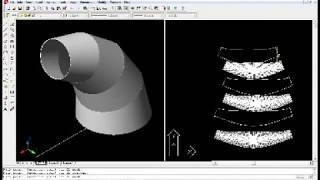 LITIO 2.0 is a sheet metal program that calculates flat (unfolded) sheet development of ducts, rectangle to round transitions, cylinders, cones, pipe intersections, connections, bifurcations, elbows, etc. for HVAC, hoppers, cyclones, dust extraction, ducts, conveying systems, silos, piping, etc. to draw your sheet metal developments directly in Autodesk® AutoCAD® R2000 and later (no need of DXF conversions). Steps of use: First select the 3D surface you want to unfold. (You can select: either inside, outside, or mid cross-sectional dimensions and/or height specifications; to draw or not the 3D surface, and the unfolded sheet as a mesh [to help you when bending the sheet] or as 2D contour [to ease cutting]; the precision of the calculation of the developments). Metric Units/Imperial units: the program automatically sets the units according to the units used in the current drawing session. After finishing the input of parameters, the program draws the 3D object and the respective development. Afterwards, you can use the 2D developments for CAM cutting (plasma, laser, etc.) or manual cutting, by plotting them 1 to 1 (1 d.u. = 1 mm or 1 d.u. = 1 inch), and using them to mark sheet and cut. * Trial is limited to OFFSET [dtX or dtY] input = 0.0. If any of them is different to zero, LITIO 2 will draw virtual objects. * There are also some patterns that are not available in Trial mode. LITIO 2 will draw virtual objects [displays a message in this case]. These virtual objects are not part of the drawing, and will disappear after a ZOOM, REGEN, REDRAW, PAN, etc. In short: the evaluation version allows the customer to get used with the program and allows him/her to draw lots of patterns; some of them are drawn as AutoCAD virtual objects, which disappear after a ZOOM, REGEN, REDRAW, PAN, etc., and which the user cannot save nor print.